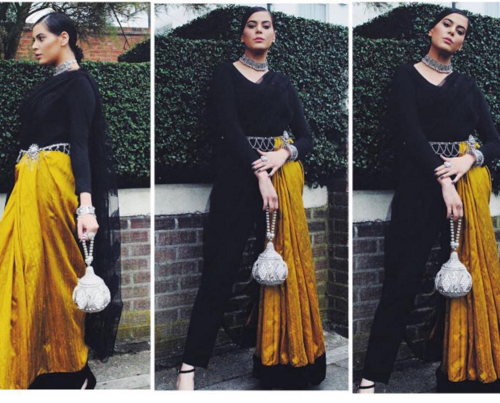 6 New Ways To Drape A Sari - Easier Than What Moms Teach Us! Do you love wearing the sari, but are oh-so-tired of the same old boring drapes? Then why not try something unconventional this season? These amazing sari draping ideas from India’s top designers and stylists will not only make you go wow, but also get you all inspired for your upcoming experiments with the ever-versatile sari. Image: Nikhil Thampi on Instagram Inspired by a south Indian sari tradition, this half sari style of draping on Kalki is giving us some serious inspiration! Half sari is a way of draping which uses two different sari lengths - one to create the “skirt” of the sari, and the other one for draped aanchal or pallu. This particular sari style here worn by Kalki, created by hip draper-designer, Nikhil Thampi, gives us fab ideas about mixing sheer layers below with a more solid one above. Image: Shilpa Shetty on Instagram Shilpa Shetty wows us here with the toga-styled draping on this sari, created by fashion icons, Abu Jani and Sandeep Khosla. Celebrity stylist Sanjana Batra adds to the bling in this look, while also keeping it elegant. This style of draping creates a graduated, uneven hemline, thus keeping it interesting. Paired with delicate white shimmery pantyhose, it looks simply amazing! Image: Nikhil Thampi on Instagram More inspiring draping ideas from wow designer, Nikhil Thampi, as he dresses Kalki in this super interesting silhouette for the Filmfare Awards. This style is reminiscent of the traditional Assamese drapes, or the shorter sari drapes used in many classical dances in India. The golden leggings sported by Kalki underneath this adds to the glamour of the quiet black above. Plus, hey! So much easier to walk in! Try it! Image: Sonam Kapoor on Instagram The front drape is a traditional way of wearing the sari, common to many parts of India. But the added twist, which celebrity stylist Rhea Kapoor brings to this drape is - trying it on an Assamese mekhela chador style of sari, which one usually does not associate with the front drape. This little experiment not only allows Sonam Kapoor to show off this amazing sari (including those awesome coloured tassels!) from noted designer Gaurang Shah, but also gives her the comfort which comes from not having to adjust the sari pallu every second! Image: Nikhil Thampi on Instagram Fashion stylist Nav Bajwa does something very, very interesting with this sari here, which keeps us wanting for more! She drapes the sari only for one half of the body of the model, leaving the other revealed in black tights. The contrast of the gold sari leaves us awed, almost as if someone has drawn aside golden curtains against a black night. Hope this leaves you as inspired for your sari experiments as it left me! HAVE A STORY IDEA FOR POPxo? If you want to hear about it, we can write about it! Just tell us your idea here! MUST-READ: 7 Beautiful Sarees That You’ll Always Look Elegant In! MUST-READ: #BollywoodStyle: 6 WOW Sari Blouses You Need To Get Stitched!